The java.util.Map interface provides three methods keySet(), entrySet() and values() to retrieve all keys, entries (a key-value pair), and values. Since these methods directly come from the Map interface, you can use it with any of the Map implementation class e.g. HashMap, TreeMap, LinkedHashMap, Hashtable, ConcurrentHashMap, and even with specialized Map implementations like EnumMap, WeakHashMap, and IdentityHashMap. In order to become a good Java developer, it's important to understand and remember key classes Java API e.g. Java's Collection framework. In this article, we will not only learn the difference between keySet(), entrySet() and values() methods, but also learn how to use them in Java program by looking at a simple example. This method returns a Set view of all the keys in the map. The set is backed by the map, so changes to the map are reflected in the set, and vice-versa. If the map is modified while an iteration over the Set is in progress (except through the iterator's own remove operation), the results of the iteration are undefined. The set supports element removal, which removes the corresponding mapping from the map, via the Iterator.remove(), Set.remove(), removeAll(), retainAll(), and clear() operations, but It does not support the add() or addAll() operations. The entrySet() method of Map interface returns a Set view of the mappings contained in this map. The set is backed by the map, so changes to the map are reflected in the set, and vice-versa. If the map is modified while an iteration over the set is in progress (except through the iterator's own remove operation, or through the setValue() operation on a map entry returned by the iterator) the results of the iteration are undefined. The Set also supports element removals, which removes the corresponding mapping from the map, via the Iterator.remove(), Set.remove(), removeAll(), retainAll(), and clear() operations. It does not support the add() or addAll() operations. 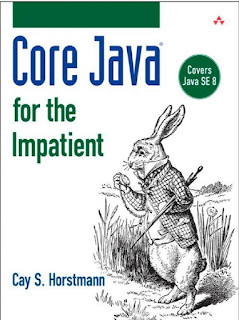 You can also read Core Java for the Impatient by Cay S. Horstmann to learn about different views of Collection in Java. One of the best books to learn Java programming at the moment. It also covers Java SE 8. Here is an example of how you can traverse over a Map in Java using the entrySet() method. This is by far the most efficient way of iterating over Map out of several ways we have discussed earlier. The values() methods of Map interface returns a Collection view of the values contained in this map. The collection is backed by the map, so changes to the map are reflected in the collection, and vice-versa. If the map is modified while an iteration over the collection is in progress (except through the iterator's own remove operation), the results of the iteration are undefined. The collection supports element removal, which removes the corresponding mapping from the map, via the Iterator.remove(), Collection.remove(), removeAll(), retainAll() and clear() operations. Similar to keySet() and entrySet(), It does not support the add() or addAll() operations. Here is our sample Java program to show you how you can use the keySet(), entrySet() and values() in you Java Program. I have just shown how you retrieve the respective view. I leave it to you what you want to do with those sets. For example, you can iterate over the Set to print the mapping, or remove any specific mapping depending upon some business logic. That's all about keySet() vs entrySet() vs values() method in Java. 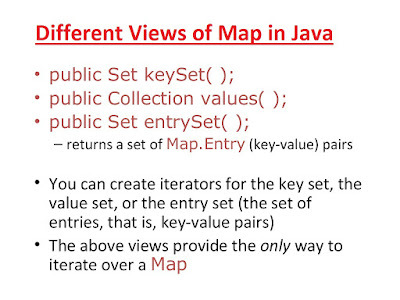 You have learned how you can obtain a different view from your Map in Java. This technique is applicable to all Map implementation including HashMap and ConcurrentHashMap. You can use these methods to iterate over Map as well as for removing entries from Map in Java. Btw, you should be mindful that these methods return collections that can be modified automatically when the underlying collection changes. This can create thread-safety issues in concurrent Java programs. You can further read Core Java Volume 1 - Fundamentals by Cay S. Horstmann to learn about this sophisticated technique of providing view instead of creating separate Map classes. How can I refresh the data in Hashmap ?